Everidge, the nation’s leading commercial cold storage solutions provider, announced today a technological advancement in blast chilling with its next generation blast chiller/freezer. Packed with innovative features and an all-new design, the revolutionary blast chiller/freezer delivers intuitive control, efficient design and time-saving performance over previous models. Its exclusive construction utilizes a seven-inch full-touch control panel with convenient programmable functions and a built-in USB interface for HACCP compliance data download. The unit is protected by three-inch thick insulation and powered by a high-efficiency condenser to help save energy while maintaining proper temperature. 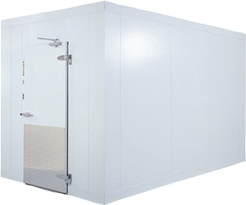 The ThermalRite by Everidge blast chiller/freezer has been meticulously refined and has the capability to take food from 194? F to 37? F in just 90 minutes or blast freeze to 0? F in just 240 minutes, a critical method for ensuring food safety. The blast chiller eliminates the need for pre-tempering food after removing it from the oven or steamer. The revolutionary next generation blast chiller/freezer will be displayed for the first time at The North America Association of Food Equipment Manufacturers (NAFEM) Show in Orlando, Florida, February 7 – 9. Chef-led demonstrations of the next generation blast chiller/freezer and the entire ThermalRite by Everidge cook-chill line will take place at the top of every hour during show hours at Everidge booth 1851.